One of the key issues facing cobalt producers is to effectively use reducing agents to maximize cobalt extraction while minimizing operating costs. In addition to reducing cobalt(III), reducing agents like sodium metabisulfite (SMBS) and sulfur dioxide may also react with previously dissolved elements such as copper and magnesium that precipitate. The amount of reducing agents could be optimized and the parasitic reactions reduced if the most suitable points of addition of the reducing agents during leaching are determined. 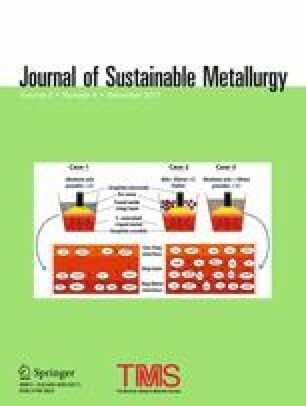 In this study, leaching tests on oxidized copper–cobalt ore were performed in order to determine the effects of SMBS addition points on the extraction behaviors of copper and cobalt. SMBS was added to various aqueous solutions at time t = 0 and t = 3 h. Regardless of the addition period, results showed that the addition of SMBS significantly improved cobalt extraction. However, a little amount of loss of copper by precipitation was observed when SBMS was added at t = 3 h than at t = 0 h.
The authors would like to express their gratitude to Tenke Fungurume mines for supplying the ore sample which was used in this study.